Welcome to the second of our weekly Five Nights at Freddy's reviews by Funko! 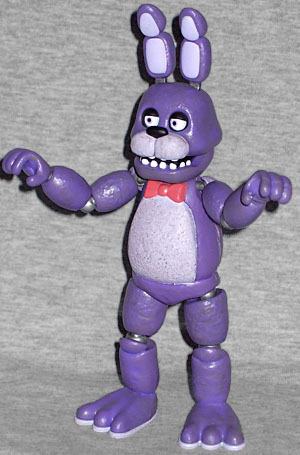 This week, it's the second in command to Freddy's leader, Bonnie, the male purple rabbit with the girl's name. Bonnie is an animatronic children's entertainer housed at Freddy Fazbear's Pizza, along with Freddy Fazbear and Chica. He is the guitarist in Freddy's band, positioned at the left side. At midnight, he is left in a "free-roaming mode" until 6 AM, to prevent his servos from locking up. Along with the other animatronics, Bonnie will attempt to forcefully stuff any human he sees after hours into a Freddy Fazbear suit, resulting in death. Featured prominently in the game's marketing alongside Freddy and Chica, Bonnie's the guitar playing rabbit who looks like it'd be right at home at a Chuck E. Cheese's. He's also one of the most persistent threats in the game, frequently returning to the security room to threaten your life, appearing at the door to freak you out, only giving you a little time to slam it in his furry face. Bonnie also appears in more rooms than the other animatronics, making him more of a pain to keep an eye on. Funko's sculpt here is soft, like Freddy's, though with slightly more detail insofar as showing the bunny is falling apart. His paint is similarly simple, looking fine from a distance but not as strong close-up. Being that this is very closely based on the Bonnie from the first game and none of the others, he's at his most completely and not-dilapidated as in the later games, and looks pretty unthreatening, really. He fits right in to your little Freddy Fazbear's Band display. 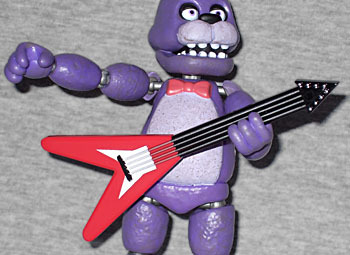 Articulation is identical to Freddy, meaning you have the same issues with the joints popping out and the same lack of posability - fortunately, holding a guitar is fairly simple, so you can pose Bonnie holding his guitar as if playing it in the band better than you can have Freddy holding his microphone. Unfortunately, this is his only real accessory: as with Freddy, Bonnie has just his band instrument and then a build a figure piece of Spring Trap, and that's it. And, like Freddy, there's no jaw articulation here, meaning he suffers from being unable to get into the awesome attack poses that you see in the game, that you probably would have wanted to. So that's Bonnie - as with Freddy, he's a fine enough figure on the cheaper side. You're kind of getting what you pay for here. 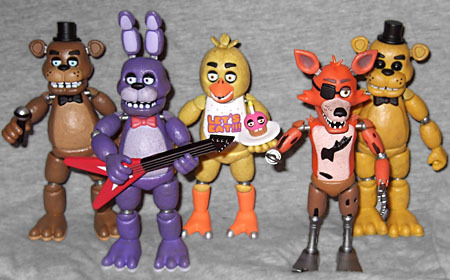 Five Nights at Freddy's is a major brand getting a movie, so if these figures don't appeal in their simplicity, waiting might be worth it in case they get a better line of toys out of a cinematic translation. Otherwise, these Funko figures will do in a pinch, even if they can't burst into the security room to make you die.